NETWORK FINALS: ABC’s Notre Dame vs. Texas game adjusted up 0.3 to 3.3 in final numbers (however, the FALL PREVIEW informercial that started the night fell 0.2 to 0.9) and NBC’s NASCAR race gained 0.1 to 0.9. BIG BROTHER also rose 0.1 to 1.4. CABLE ORIGINALS: AMC’s FEAR THE WALKING DEAD led Sunday cable, although it was down a hefty 0.35 on the holiday weekend Sunday. 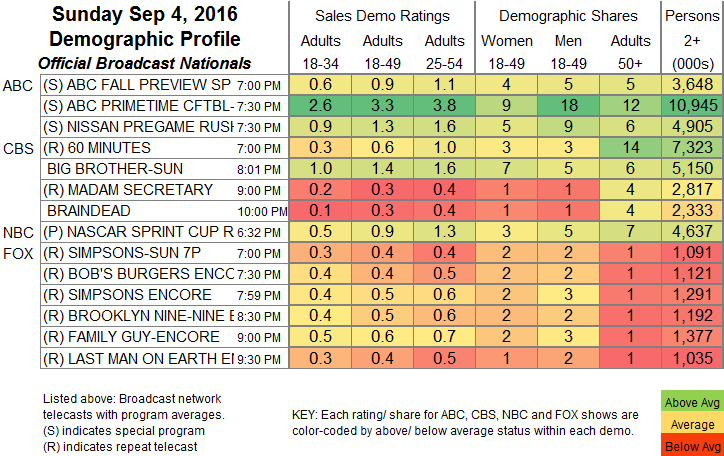 TALKING DEAD was down a more moderate 0.03 to 0.45, and GEEKING OUT fell a hundredth to 0.11. HBO and Showtime took the night off, so the only pay-cable game in town was Starz, where POWER was up 0.04 to 0.88, and SURVIVOR’S REMORSE ticked up to 0.34. On E!, KEEPING UP WITH THE KARDASIANS bounced back from last week’s MTV Awards competition to the tune of a three-tenths rise to 0.68, and WAGS was helped by having its lead-in back, up a tenth to 0.30. On TNT, THE LAST SHIP lost 0.02 to 0.48, and the season finale of MURDER IN THE FIRST rose 0.05 to 0.27. FX’s THE STRAIN fell two-tenths to 0.42. On Food Network, GREAT FOOD TRUCK RACE dropped 0.11 to 0.38, GUY’S GROCERY GAMES was down 0.08 to 0.35, and COOKS VS CONS plunged 0.19 to 0.31. Hallmark’s CHESAPEAKE SHORES added a tick to 0.31. 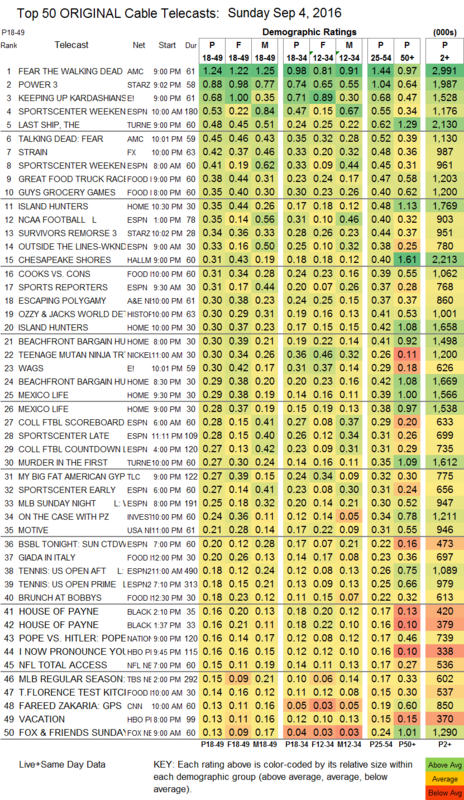 On A&E, ESCAPING POLYGAMY was down 0.02 to 0.30. History’s OZZY & JACK’S WORLD DETOUR climbed 0.04 to 0.30. TLC’s MY BIG FAT AMERICAN GYPSY WEDDING was up 0.01 to 0.27. USA’s MOTIVE gained a tick to 0.21.